It Was 50 Years Ago Today….Well It’s 25 For Me - GeekForce | Experience The Power Of The Geek! How many times over the next few weeks will we see those lines as a heading to an article about Sgt. Peppers? This is because The Beatles’ Sgt. Peppers album turns 50 years old and it’s a play on the opening line of the of the song – “It was 20 years ago today Sgt. Pepper taught the band to play…”. But I’m not really going to talk about the album. Far more enlightened people can talk about the album and dissect it. 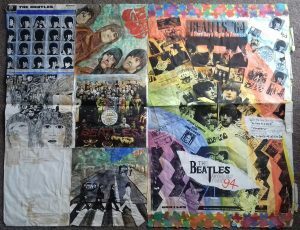 I’m going to tell you about how I fell in love with The Beatles 25 years ago (almost today). I’d first been introduced to The Beatles through their solo careers, you can read about my love of Paul McCartney here . I first heard George Harrison in 1987 through Got My Mind Set On You and When We Was Fab. Gary, my brother, bought both of these singles. I remember Got My Mind Set On You playing, and seeing the video with George in the chair and the house bouncing along to the song, in the six weeks holidays as we played Action Force at my nan’s house. So when did I make the leap to The Beatles? I’d seen the Yellow Submarine cartoon when I was little a few times, that hippy trippy film, at the time I just saw it as a cartoon. I must have been about 13 when I first tried to listen to The Beatles. My Uncle Michael had given me a few of his vinyl LPs – Dave Clark Five, The Searchers and Rubber Soul by The Beatles. I remember one Friday night before Cheers was going to be on playing the first few tracks on the album – Baby You Can Drive My Car, which is the sound I sort of expected, guitars and rock ‘n’ roll. Then came Norwegian Wood and I thought “What is this?” For some reason I was expecting rock and roll and I didn’t play anymore. I wasn’t too keen on the sound, so left it at that. The music I was into before The Beatles was chart pop and heavy metal. I had a few compilation tapes of heavy metal music. I’d got into this really through Bill and Ted and Wayne’s World. At this age you are just getting into music and what will define you for the rest of your life. I do still like some heavy music but through The Beatles I went indie, oh it could so easily have been different! 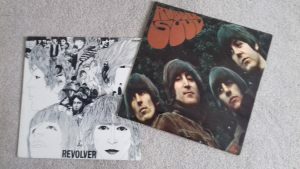 So what was the next stage of my Beatles education? The 25th May 1992 was a Bank Holiday Monday and on Radio Nottingham was The Beatles Bank Holiday Bonanza Special – a show lasting around three hours in the morning. While my Dad was converting the loft he listened to the radio and this was on. We taped it to listen to again. I wish I still had that tape. It had a lot of the songs played on it. I Am the Walrus stood out, Paperback Writer and Carry That Weight to name a few. A couple of solo tunes – Imagine by John Lennon and Another Day by McCartney. Other Beatles related things happened in quick succession after the special on the radio. First there was a double bill of The Beatles’ films on one Sunday afternoon (14th June 1992). I was hooked by these films. I loved a Hard Day’s Night – “He’s very clean”! Then that night there was a Southbank Show Special – The making of Sgt. Peppers. This probably changed my life. The opening of the documentary had George Martin saying that for the album still to be talked about 25 years on shows what a wonderful album it is, and here we are another 25 years on still talking about it (and those 25 years have flown by!). A few weeks after this on Thursday (according to my diary) , after I’d seen the films and documentaries on TV, I went with my dad and Gary to Hucknall Flea Market. This was in the days before the price of vinyl albums started to go crazy. There was a lot of vinyl record stalls and videos, two things I loved! So on this particular night Gary bought Live Magic by Queen and Born in the USA by Bruce Springsteen. I got Sgt. 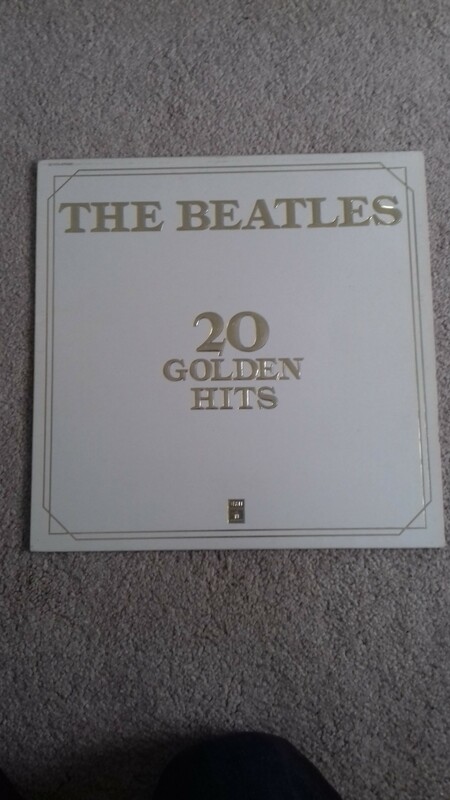 Pepper’s Lonely Hearts Club Band and also a best of: The Beatles – 20 Golden Hits. The documentary I’d watched four nights ago I was now going to hear the whole of the album. I got back home and played it on the record player in the front room. I LOVED IT. I played it a lot over the next few months. Recorded it on to a tape so I could play it on my Walkman. It went everywhere with me. I’m not going to go into any detail about the album. Just listen to it and be blown away. As a weird aside to the records it was election time around this period in 1992 and The Natural Law Party were campaigning for votes. I had the manifesto and was fascinated by the yogic flying. George Harrison was also campaigning for them and if I could have voted would have gone with them purely because of that! What I will tell you is that I did listen to Rubber Soul after this and finally got it! Pepper’s had opened the door into other worlds of music. I loved Norwegian Wood and Michelle, how can you not love Michelle? My mum had a lot of the Beatles early EPs and singles and I played all of these and put them on compilation tapes of the Beatles. There was also a programme on Radio Nottingham on Friday nights from 8pm – 9pm where they played The Beatles, Elvis and Cliff Richard. They’d play one of The Beatles, followed by Elvis and then Cliff. This later became just The Beatles hour. They also played songs from their solo careers so this was the first time I heard things like No Words, Getting Closer and Mamunia by McCartney, All Things Must Pass, It’s What You Value and You by George Harrison, Freda People, Mind Games and Watching the Wheels by John Lennon and You’re Sixteen, I’m The Greatest and It Don’t Come Easy by Ringo Starr. I remember first hearing And I Love Her on the show and thinking what a great song. I did eventually stop listening to the show as I eventually had all The Beatles records and their solo material. 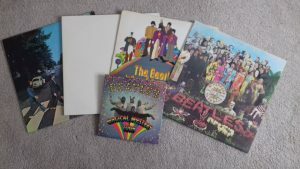 Being at School I didn’t have the income to buy all the albums at once but when I went with my dad to Hucknall Flea Market over the next year I got a few other albums. 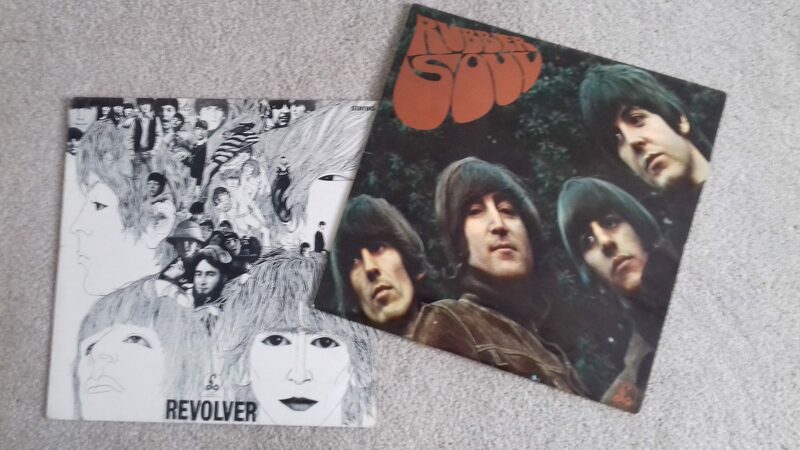 The next one I got was Revolver, I loved the cover and obviously had part of the cover to the single for George Harrison’s When We Was Fab on it. This album was followed by A Hard Day’s Night which had the aforementioned And I Love Her on it. I took weeks just playing these albums until I knew every line and song. In my final few months at school I got Abbey Road and I found it amazing, especially the progression within a few years from Pepper’s to this. Abbey Road still remains my favourite Beatles album. What I do love about The Beatles albums and found fascinating at the time of getting into them is the amount of songs that were not on albums that were just released as singles or on EPs. Something that obviously you don’t get in modern music. You put your best songs on the albums so people buy the album. The Beatles didn’t operate like this they had good songs in abundance so Strawberry Fields Forever/Penny Lane and Paperback Writer/Rain were not on albums, well not until they were on best of albums. I went to College and in about the October time we went to Hucknall Market and I bought “The Beatles” also known as “The White Album”. 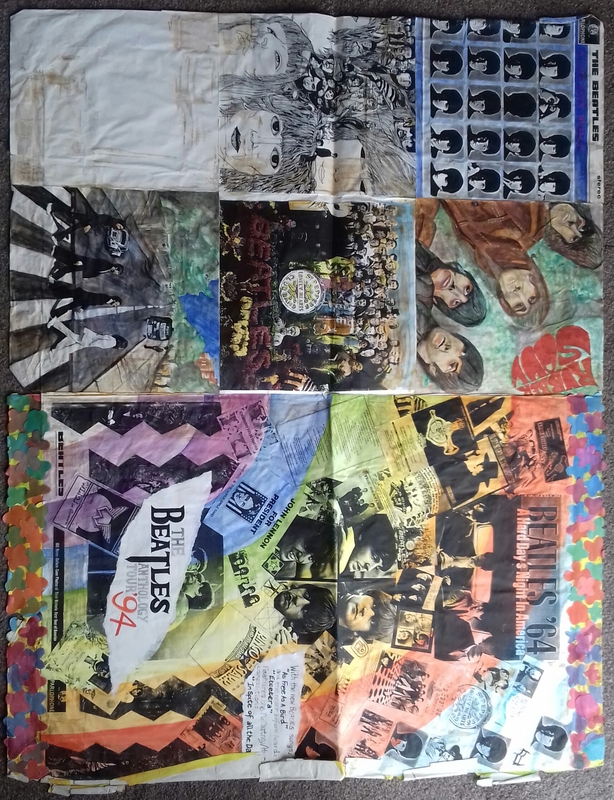 I paid £15 for the original vinyl for this at the time, it included the poster and the four individual photos of The Beatles. I think it is probably worth double that now if not more if you were to purchase it. I bought all the other albums and it’s only recently I bought Please Please Me on record. The only one I am missing on vinyl and never had on vinyl is Let It Be. I’ve always said when I get it I will get the original box set they released – you have to have a goal. I also produced a few pieces of art work for secondary school and college. The college piece I produced was based on reading that the Anthology was being made. This piece of art I produced in 1994, a good year before it came out or anything was released about it. I was pleased that the tearing effect and layers of photos were actually used on the Anthology poster. In truth I was obsessed with The Beatles and although I did listen to other musicians and groups I compared everything to them. From 1992 to 1995 I listened mainly to The Beatles. It wasn’t until indie music really kicked in in 1995 that I started to listen to the charts again. A song that really made me start listening to indie music was Whatever by Oasis, so you can see The Beatles influence. I would say at this time if you asked me a question on The Beatles no matter how obscure I could have answered it. 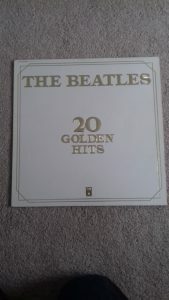 The Anthology came out at the end of 1995 and it was a great period for every Beatles fan. They timed it to perfection with the current music scene and they were just at the right age to do it. Since then both George Harrison and George Martin have passed away. Although we have had the Ron Howard documentary on touring and the new Sgt Pepper’s documentary they will never be the same without all the band and key players. John was missed in the Anthology but without George….well it’s a duo. As John Lennon said you’ve got all the albums you can still play the music. That’s the great thing about music it can take you back to another time and another place. To a time you first heard a song or moment in your life. I’ll never forget my early Beatles memories. So 25 years on from my Beatles beginnings, 50 years on from the album’s release, and we’re still talking about it and in another 50 years’ time we’ll still be talking about the album that changed everything.